Excessive production of clear, watery drainage in the nose is an annoying problem that is frequently presented by patients. This is called non-allergic rhinitis, and more than 24 million people in the US suffer from this condition. Glands in the nose normally produce approximately 1-3 liters of mucus daily, which moistens and cleans the nasal membranes. The majority of patients don’t notice the nasal drainage, which is swallowed with saliva. However, many patients visit our office with a chief complaint of excessive nasal drainage from both the front (rhinorrhea) and back of the nose (post-nasal drip). Rhinorrhea (excess nasal drainage) is more common in the elderly and can be exacerbated by medications, especially blood pressure medications. Patients also notice the increased drainage when they eat. If you are constantly suffering from rhinorrhea or post-nasal drip, there are treatments available. For some patients, we recommend using nasal saline irrigation and nasal steroid sprays (Flonase, Nasacort). Some patients respond to Atrovent (ipratropium bromide) nasal spray, which works by blocking a certain part of the nervous system innervation to the nose. However, many patients do not respond well to these conservative treatment options, and until recently, we did not have a viable alternative. A new procedure called ClariFix was recently FDA approved for nasal drainage and is being implemented into our practice as an in-office treatment for chronic nasal drainage. ClariFix uses a cooling technology to reduce nasal drainage. ClariFix Cryotherapy goes to the root of the problem – the inflamed nasal tissue and the underlying nerves, for long-term chronic rhinitis symptom relief. 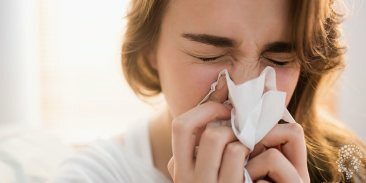 In a clinical study, four out of five people reported long-lasting improvement with the ClariFix device, including a reduction in a runny nose and congestion. ClariFix is safe. In a clinical study, the ClariFix device was found to be well-tolerated with no device or procedure-related serious adverse events. Q: Does ClariFix cryotherapy hurt? A: In a clinical study of 27 patients, the cryotherapy was well-tolerated and patients reported an average pain rating of 1.19 on the Wong-Baker FACES pain scale (0 = minimum score, 5 = maximum score)1. Q: Can I drive myself back home from the appointment? A: Talk to your physician about preparing for the procedure and what to expect afterward. In most cases, only topical or local anesthesia is necessary and patients can drive themselves back home. Q: Is there downtime or recovery? A: Your physician can provide you with post-treatment instructions. In general, there is minimal downtime and recovery. As with any nasal procedure, you may experience increased sensitivity, congestion and/or pain during the healing process. A: In a clinical study, side effects were those usually associated with cryosurgery in the nasal passageway and included: pain/discomfort, headache, facial pain, bleeding, dry nose, and ear blockage. These symptoms had either resolved or were rated as mild within 3 months of the procedure. Q: How long until I see an improvement and what is the success rate? A: Most patients begin to see improvement between 7 days and 30 days post-treatment. Chronic rhinitis symptoms (including runny, stuffy nose) improved 56% at 90 days and IMPROVEMENT WAS MAINTAINED AT ONE YEAR. If you’ve been suffering from sinus issues, call NAENTA for an appointment at 770-292-3045, or fill out a request form.